This past weekend was one that my kids will not soon forget. They had an absolute blast with their new best friend. He’s someone that is able to keep their attention far longer than I can, and teach them fun things while they laugh and play along. Who is this mystery friend you ask? It is Play all Day Elmo! Click to view larger image! 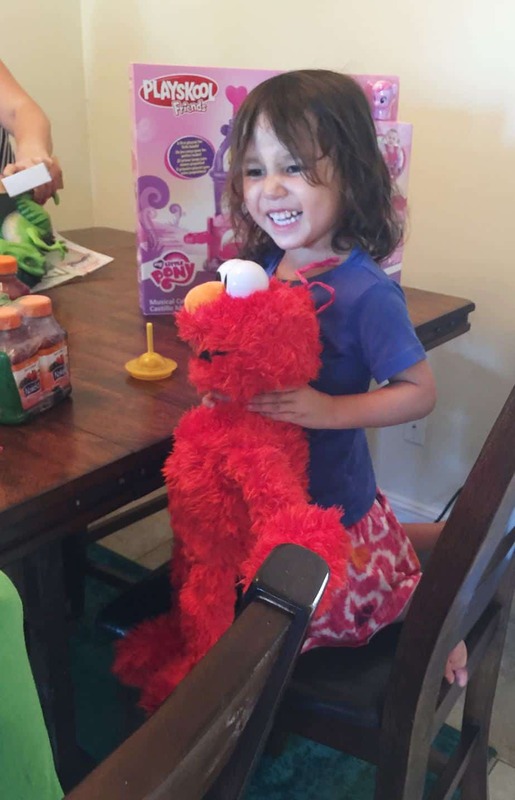 My daughter is 2 years old and a big fan of Elmo, and we keep an eye out for things associated with him as there’s a great chance it will be fun, positive and educational. 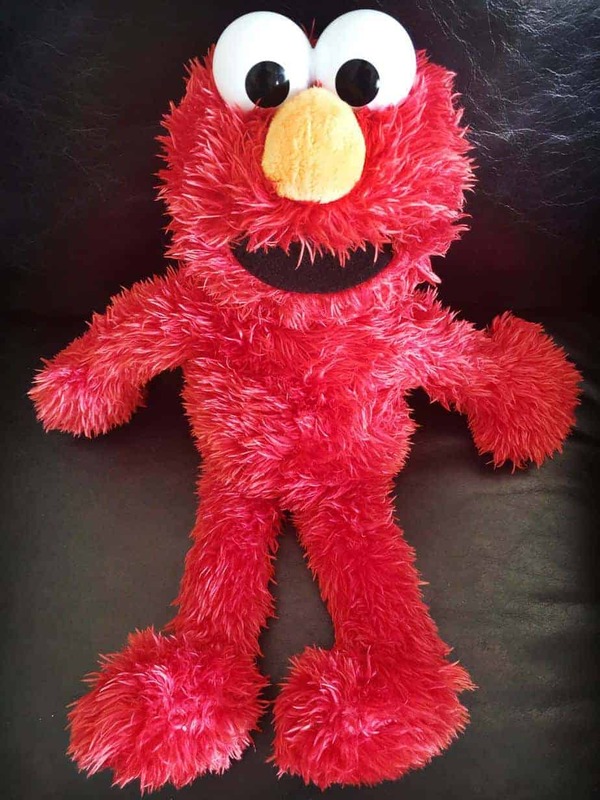 There’s a toddler mode on Play All Day Elmo where she and some of her youngster friends could squeeze his nose or turn him upside down to see how he’d respond. Elmo also has a lullaby mode that they got a kick out of and that my daughter LOVES to listen to at bedtime, (note: he’s soft and huggable and a great sleepover friend). I didn’t think my son would be as interested in Elmo but it actually has a preschool mode too, with games like Pat-a-Cake, Color Guessing, Animal Sounds and more. I love how my son can follow along and use his brain, rather than just watch something on the tube or a video game. 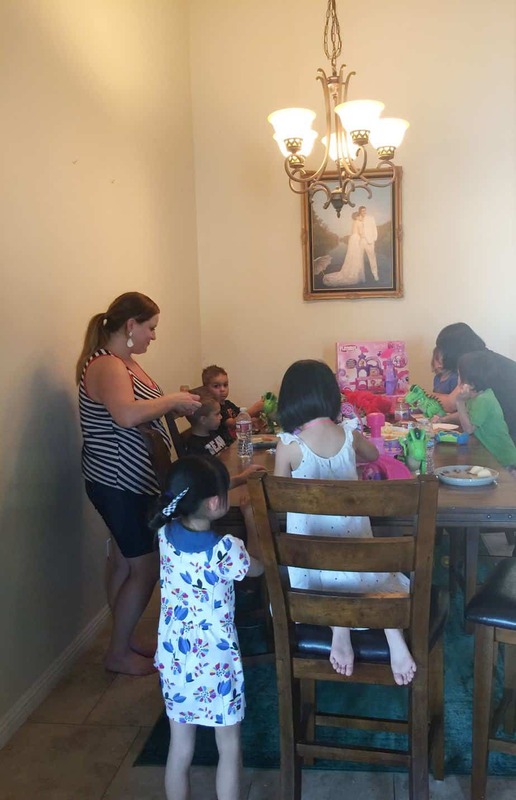 It was great to watch him and his preschooler friends talking about Elmo’s instructions and discussing how to play the games, and then interacting and having fun playing them. Red Light Green Light was a favorite. Overall there’s a huge variety of over 150 responses from Elmo and eight different games and activities. You can pick up Play All Day Elmo at most of the big retailers across the country and also at HasbroToyShop.com. Elmo wasn’t the only hit of the party, the girls were all over the MY LITTLE PONY MUSICAL CELEBRATION CASTLE by PLAYSKOOL, which had two ponies (PINKIE PIE and STARSONG) and a castle-like structure whereupon they could go down slides lay down for a nap, spin around on a marry-go-round and more. The bright pink and purple colors drew my daughter in and then hearing the music it played made her day. 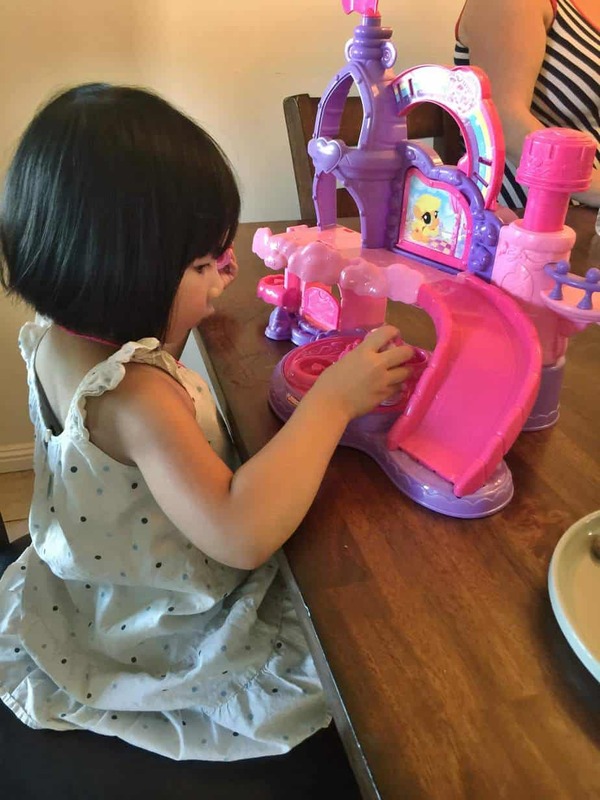 She is all about castles, princesses as well as cute animals and this brought it all together. Toys like this that provide a lot of extras but still let kids use their imagination are the best. The toy has a retail price of $29.99 and is for ages 18 months and up. It’s compatible with other figures which I plan to pick up as my daughter loves the cartoon and wants to get the whole gang. 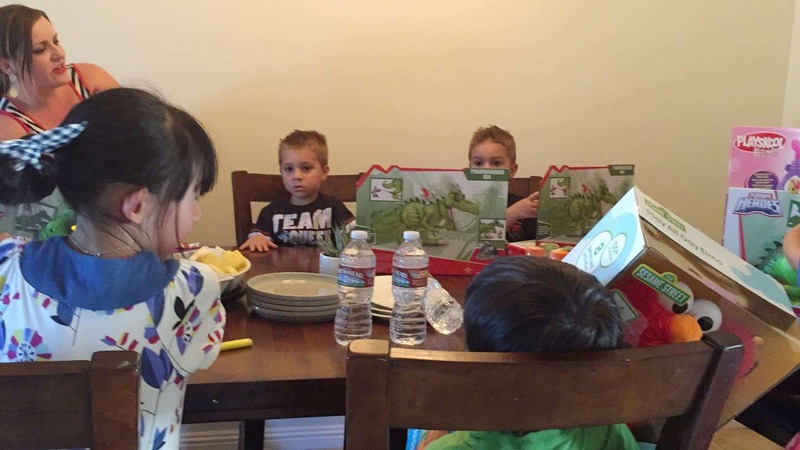 The boys meanwhile flocked to one of the new toys from the PLAYSKOOL HEROES JURASSIC WORLD brand (which has characters from the Jurassic World movie). My son’s favorite dinosaur is the Tyrannosaurus Rex and the JURASSIC WORLD TYRANNOSAURUS REX does it justice. He didn’t want to put it down as it has light-up eyes and a ferocious roar. It comes with a human who is geared up with some capturing equipment but I saw a common theme of the guy getting gobbled up by the T-Rex time and time again. It was so fun to watch. This toy is big and durable and is also a great deal with a retail price of $29.99 (HasbroToyShop.com or most major retailers). Dinosaurs have always piqued my son’s interest and have led him to ask a lot of questions about the Earth and science as a whole. I am a-ok with him getting some exciting dinosaur toys that will spark more questions. I don’t always have all of the answers… my son started asking whether the T-Rex ate certain animals and now I have some homework of my own. What an exciting and memorable party. The kids all love Elmo and I’m always on the lookout for new items to buy them. I think I already bought the Play all Day Elmo. I’ve always loved Elmo. Looks like the kids had a great time! The kids looked like they had fun. 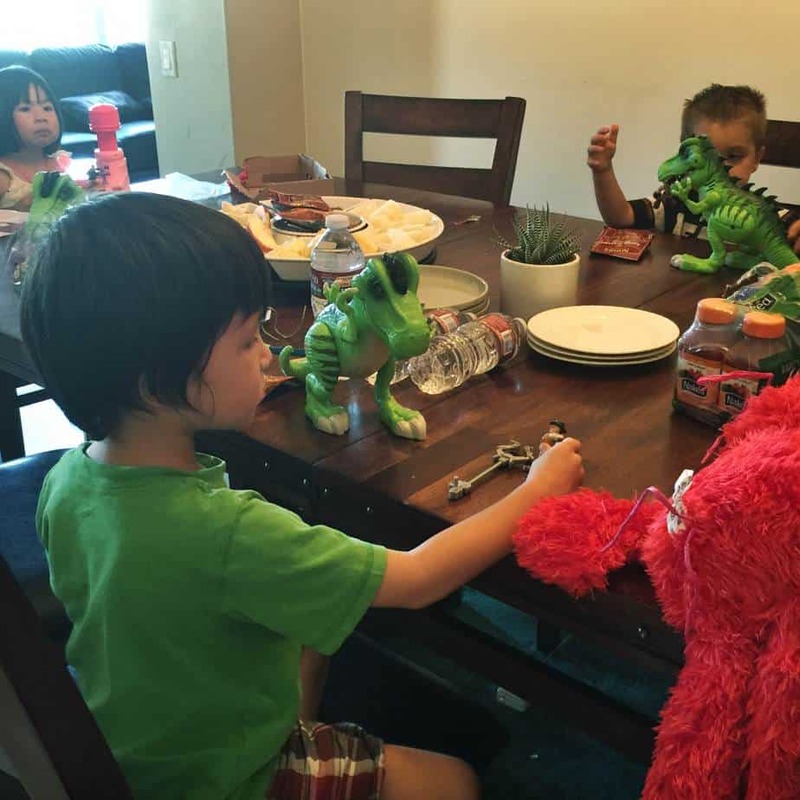 Elmo is such a fun little guy for the kiddos to play with. My kids loves elmo, they really wanted to watch elmo in whole day. 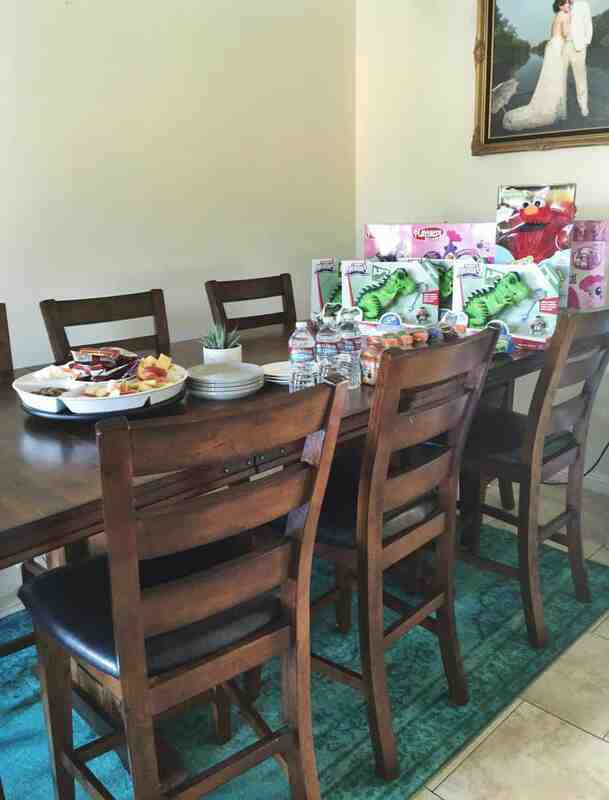 My niece loves elmo, she’d love to have an elmo party day. That’s a lot of toys! My girls loved elmo when they were little and would always watch his show! It looks like they had fun. my son would really loves elmo and he is using elmo is his theme for his 7th birthday theme. 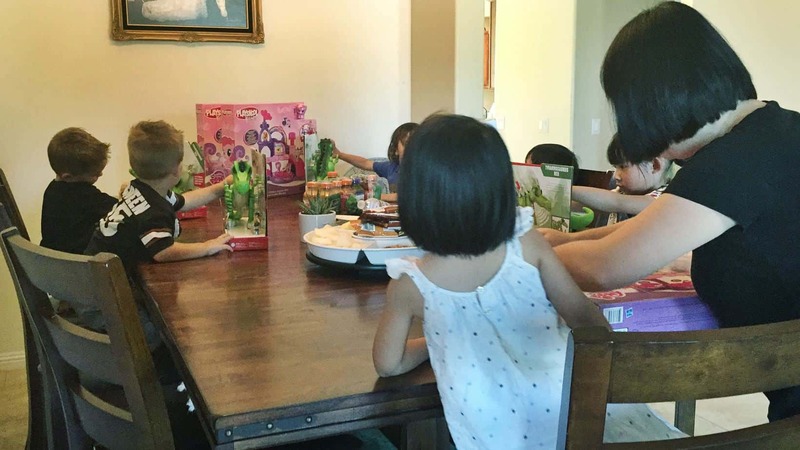 Looks like the kids had a blast with the toys. My son loved Elmo when he was young. The looks on their faces says it all. My boys love Elmo. This looks like a fun party. My girls would love that My Little Pony Castle. I love it when they go through their phases. I’ll check it out. Elmo was such a part of my kids’ growing up years! They are now all grown up but still cannot resist watching re-runs of Sesame Street! I have a little niece who would definitely love to have something like that. Oh my gosh, I used to be obsessed with elmo when I was little! I bet my son would love this! What a fun party. Elmo is my kids’ favorite, too. The kids looked like they had so much fun with the toys. My kids absolutely love Elmo. What great party idea. Love all the pictures! Must, must share this with my daughter. Might be an idea for my granddaughter’s second birthday! I haven’t seen the Jurassic toys. Bet I’d like them. And I love Elmo. What a great opportunity! It looks like such fun! My 5 yr old would be thrilled to go to a party like that! Forget the kids. I love Elmo! Now I have the Elmo’s World song stuck in my head! Such a cute elmo! He was one of my daughters favorites growing up. My kiddo is about to turn three. These would make some great gift choices. How fun! Red light green light is also a favorite in our house. That is a great party theme. You can’t go wrong with Elmo there.Cute pictures.